This could be your summer of NI software. Native Instruments' Summer of Sound promotion has become something of a tradition, and it's back for 2015. Offering current product owners 50% off updates, upgrades and crossgrades, this month-long sale runs until 30 June. There are numerous deals on offer, but one of the more notable is that which enables owners of a Komplete Kontrol S-Series keyboard or Maschine hardware product to get Komplete 10 or Komplete 10 Ultimate for half price. 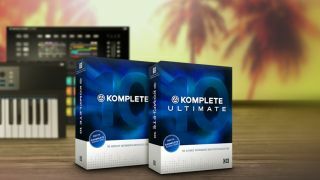 You can also take advantage of this price if you own an older version of one of the Komplete bundles. Similarly, if you own a qualifying NI software product you can crossgrade to Komplete 10 for half price, while Maschine owners who are still using the original software can get the same level of discount on the upgrade to the latest version. Finally, there are opportunities for owners of various NI software products to upgrade to the latest version for half price. Full details of all the deals are available on the Native Instruments website.